From designing the 2016 Batmobile to a hydro-jetpack to a cup that can contain three different sodas, Wes Cross has had an expansive career in engineering. 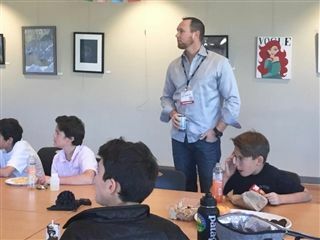 Mr. Cross spoke to students during a SPARK session about how he engineered cars for popular movie franchises and how he got his start in the automotive industry. Students were treated to inside information about the Batmobile and all the impressive engineering feats Mr. Cross and his team pulled off.